I really wanted to like Inglorious Basterds, particularly because each of Tarantino’s movies before this (with the possible exception of the mind-numbingly slow Jackie Brown) surprised me in some new and exciting way. When you watch Kill Bill, you can feel the energy pulsing from every shot, every scene, and when you watch Reservoir Dogs or Pulp Fiction (violent though they might be), you get a sense that this is a director who is absolutely in love with the filmmaking process, and that love is infectious, spreading to the viewers. 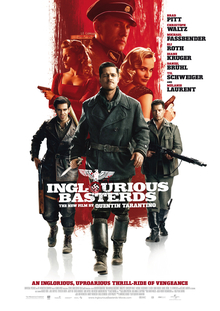 Inglorious Basterds, while enjoyable at times, and while consistently interesting, just didn’t seem to hold together in the same way as Tarantino’s other films. I think that Tarantino’s dialogue is now more successful than ever (if that’s possible), as there were scenes in Pulp Fiction that simply felt self-indulgent: the Quarter Pounder conversation, while funny, really had no relevance to the story, and just felt like Tarantino was trying to be clever. In this film, though, even the clever conversations are constructed in a way to build tension…instead of simply listening to the ramblings of a Nazi officer for ten minutes as he speaks with a French dairy farmer, Tarantino cuts away in mid-conversation to reveal the hiding Jewish family beneath the floor boards. Now, suddenly, every word carries extra weight; anything could give away their presence, and any moment could be their last. Yes, this is a movie with many fine scenes, and Brad Pitt’s performance is a comic masterpiece. Mike Myers even makes a hilarious appearance as a British officer, and the homage to the war flicks of the ’50s, ’60s, and ’70s is brilliant and inspired. But…Inglorious Basterds feels strained and labored in a way that none of Tarantino’s other films do. This is a project that took many years to produce, and we can see the hesitance on-screen; for once, there are moments that don’t feel like electric fun (i.e. Grindhouse, for all its silliness), but instead like…work. It’s like comparing black-haired Obama on the campaign trail, making energetic speeches and shaking hands, to suddenly gray-haired Obama, explaining yet again to the American public that there are no such things as death panels. Perhaps the most telling flaw in this film, though, is in the Inglorious Basterds outfit themselves. Here, we have a movie built upon the premise of a group of Jewish soldiers who go behind enemy lines to terrorize the enemy. This is the title, after all: “Inglorious Basterds.” And yet the outfit collectively manages just ten minutes of screen time. Brad Pitt gets many of his own scenes, but the supposed focus of the film (the secret Jewish team) is clearly not the focus. In fact, we meet only three or four of these soldiers, and–by the end–they’ve really contributed very little to the story itself. The film opens with a scene in the French countryside (a Jewish girl escapes a massacre), cuts to a quick scene of the Basterds in training, and then the Basterds doin’ their thing in France, then spends much of its remaining run time with the Jewish girl, as she plots to lure the Nazi high officers to her theater, whereupon she will burn them all to a crisp. (Spoiler alert) By the end of the film, the girl is successful, with no real help from the Basterds, who are relegated to sub-plots that could have been omitted entirely from the film without affecting its outcome. In other words, the film’s subject–the Inglorious Basterds–is not truly its subject. It’s a clear case of a writer “telling too many stories at once,” trying to make them all fit into one movie, even when certain sub-plots simply aren’t relevant. Had Tarantino made a movie simply about the Jewish girl (call it “Kill Hitler!”), this would have been a tighter film, but it wouldn’t have had the fun marketable angle of Brad-Pitt-led soldiers storming enemy lines to kill Nazis. Had Tarantino made a movie simply about the Basterds, omitting the Jewish girl’s story, this would not have been a story at all, so thin is the Basterds’ thread. Inglorious Basterds, in the final evaluation, is a slick homage, and you might enjoy the overall experience (especially if you’ve watched a lot of old war movies), but it’s also one of those movies that–like Gangs of New York, which I loved, but which also seemed to suffer in the final act from an unraveling plot–feels like it was over-thought, over-produced for too many years, the original germ of an idea suffering under so much reconsideration, so many revisions.